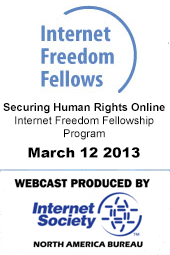 As it did in 2012, on Tuesday March 12 2013 the Internet Society’s Greater Washington Chapter (ISOC-DC) will again host this year’s Internet Freedom Fellows in a follow up event to their induction in Geneva. The Fellows will have an opportunity to discuss their experiences advocating for basic human rights and the role of the Internet in formulating their success. The event will be webcast live by the Internet Society’s North America Bureau.